Sometimes it's nice to have a protoboard that's super long and skinny, super small, or just a bunch of holes. 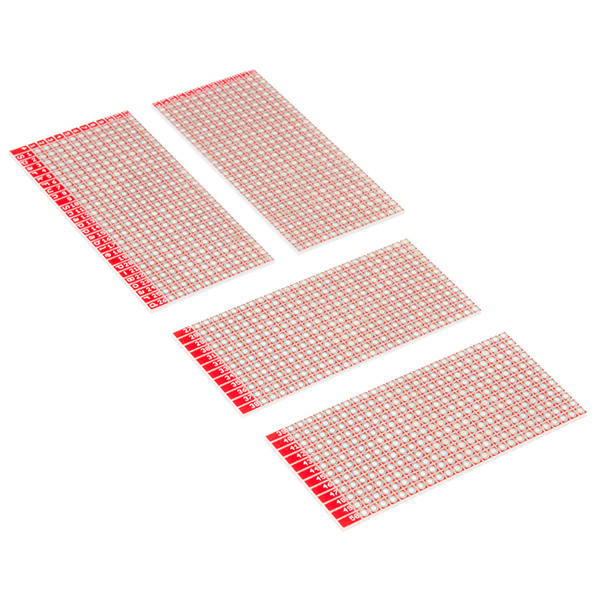 The SparkFun Snappable Protoboard is a large PCB crisscrossed with v-scored lines so that you can choose just how long and wide you need your custom perf board to be. The Snapable Protoboard makes obtaining the perfect sized prototyping area for any given project as straight forward and uncomplicated as possible. 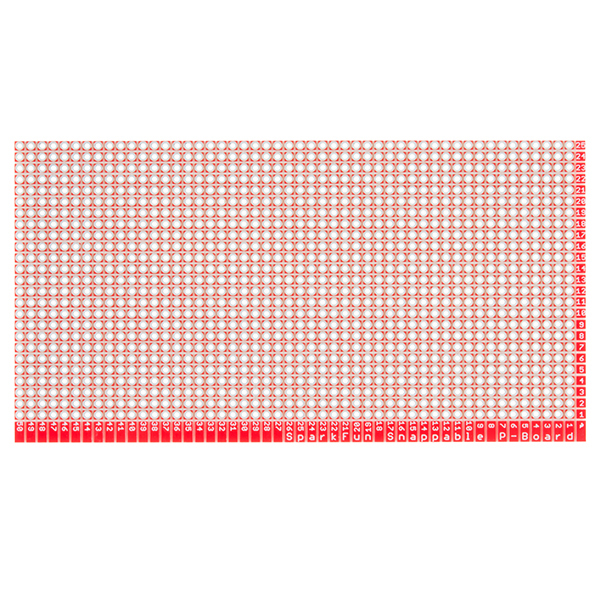 Each SparkFun Snappable Protoboard features a 0.1" spaced, 50x25 Solder Point array totaling up to an impressive 1250 PTH pins that can be broken apart to form a 2x2, 1x50, 24x42, or any size whatsoever as long as it is within the original array size. 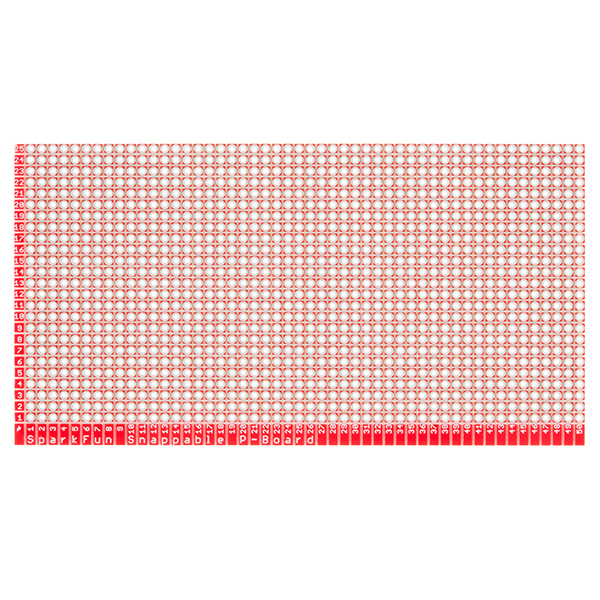 Don't think of this as just one protoboard, think of it as any number you need. The movements of connected colleagues translated into a living artwork - using Adafruit Feather Huzzah, servo motors, plywood and paint. 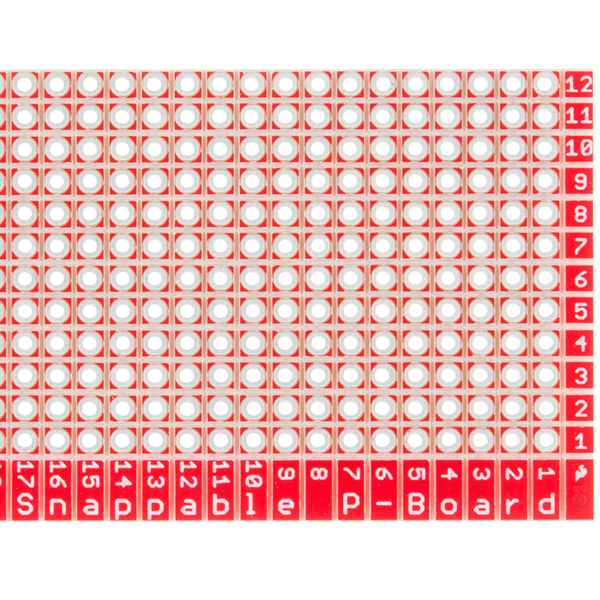 anyone have a good tutorial for adding traces to rows or columns of pin holes? I can't review since I purchased this via Digi-Key with a larger order of stuff that Sparkfun didn't carry all of... unfortunately, the holes are on the small side. They would not even fit a button that had 1mm leads. I'll need to find something else to prototype with. The video mentions "Low pile concrete over carpet". Like this table? Seems like a lot of construction work to get an internal cutout from this board, but at least you can get the wool carpet pre-made: you can skip the shave-a-yak step! It's about time! No more trying to cut the right size with a hack saw, and accidentally screwing the whole thing up. Thanks, SparkFun. Very noob question.. but.. I ask : How the points of this board are connected between them ? I prefer them unconnected; it's easier to make connections than to break them in my experience. I do use a lot of wire wrapping with this, and solder blob tracing. I had considered some buses on this, but the V-score actually makes that impossible. It will break any copper it crosses and it must go the whole width of the board. I am wondering this too. I got a protoboard from eBay last week and in the picture the holes looked connected, but when I got it I found out they weren't. Whoa! Wish this had been available when I placed my order earlier this week. Thank you, Sparkfun, for your obvious concern for my respiratory health. Cutting protoboards with a dremel can make quite a mess. 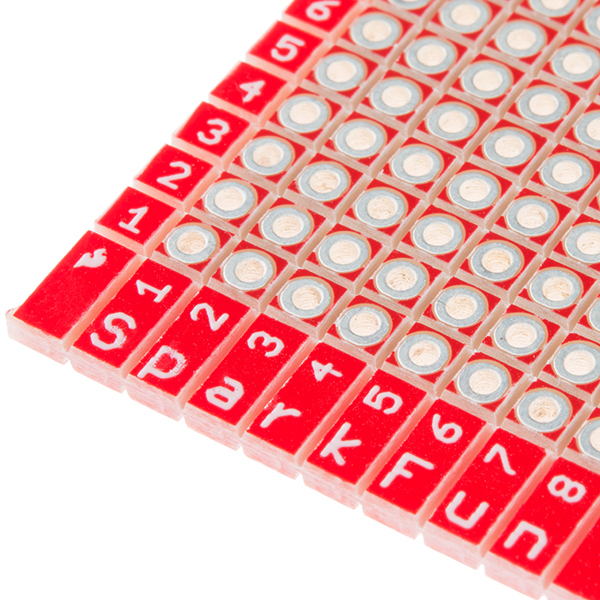 Innovation like this is why sparkfun is around! Am just starting in electronics as a hobby (retired) and made a couple of small boards with the snappable Protoard. Great product - just what I was looking for. You can snap off just what you need and not waste material. I am using it for finished board - not just prototyping. This board should solve difficult to fit spaces. The board arrived just fine because it was properly packed. And it is exactly as described; therefore, I expect to solve several difficult to fit circuit placements. The quality is high and the finish and silk-screening is excellent. It's always been hard to get exactly what you want in a protoboard, but this snappable board ends that. Very easy to snap into the size and shape you need. Connecting traces together with solder can be a little trickier, due to the v-scores, but that's to be expected. All in all, this is my favorite board for rapid prototyping. I would like to see a few different sizes of these to spread the price point around. Thanks SparkFun! Fastest way to prep a proto! Cutting protoboards always a pain and usually break where you don't want a break - with this you just bend it over an edge and you've got your board in seconds! This is my new standard. Decent price, too. Highly recommended. The idea and concept of a snappable board is genius and super convenient. I love it. However, the board itself is pretty small. If im going to cut something up, there will be left over small unusable parts. In order to reuse the product there has to be a lot left. Think wrapping paper. Depending on the size/shape of your project, you might have to buy one of these per project and throw away whatever doesn't get used as scrap. The other thing is that it was actually pretty hard to snap the board. That's not a deal breaker but something to be weary about when first using the product. Don't underestimate its strength haha. But all in all it's great. Great idea, great product. Hopefully version 2 will be even better. I work in an industry where we are always in need of quick custom solutions/prototyping and this board is just that solution. Unlike my father, this board is there for me when I need it most. Oftentimes, tasks require a custom circuit and if you were never taught how to properly use a band-saw or CNC machine (due to the absence of strong male role model in your life) then this product is perfect for you. Even if over time you've taught yourself how to use the previously stated tools (despite your father going out for a pack of cigarettes and never returning) it is still a much simpler (and faster) process to simply snap the board to the size you need. I give this product 4 out of 5 stars simply because I have a hard time fully committing to 5 whole stars. I feel if I put my full feelings into this then the product might just up and leave with no warning, making me forever wonder if this board has a family somewhere else that it prefers over me. Well, easy to snap! They work well for quick little prototypes and ideas. Cutting fiberglass circuit boards does not require an expensive sheet metal brake or a fiberglass-dust-creating rotary tool. Instead, score both sides with the box cutter using a metal ruler as a straight-edge until the score line is weak enough to snap in your hands. If the board is really thick, you can place the board in a vice with flat metal jaws, align the score line at the top edge of the jaws, and use a metal straight-edge as a lever to brake the board. 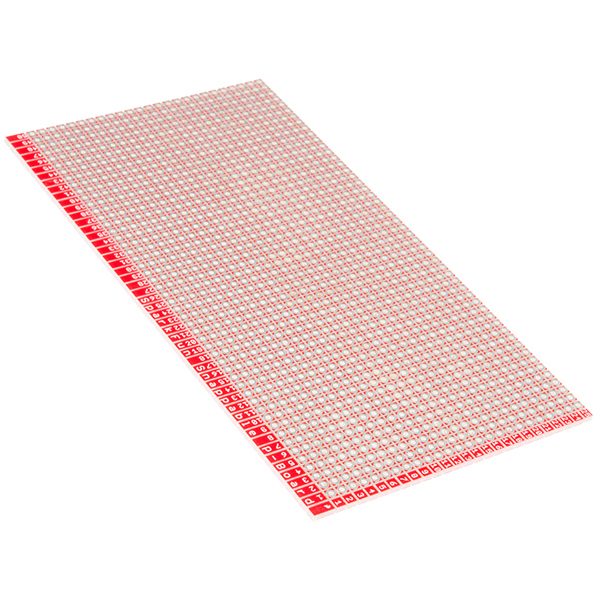 There are two changes that will make this product great: (1) thick boards and (2) larger boards. These boards are way too flimsy. Make the boards thicker and we can use a box knife to trim the boards using the score lines provided. (Note - I edited this post after building a few projects with these boards and I had to add headers to stiffen the boards. I reduced the rating from 4 stars to 2 stars. This is a great product idea! Put the score marks on thicker boards to make a great product. I had to make a large number of tiny (2 holes x 4 holes) boards for a school project. The snappable protoboard totally fit the bill! Thanks, Sparkfun! My only critical comment is that I snapped apart a lot of pieces before I got the hang of it. 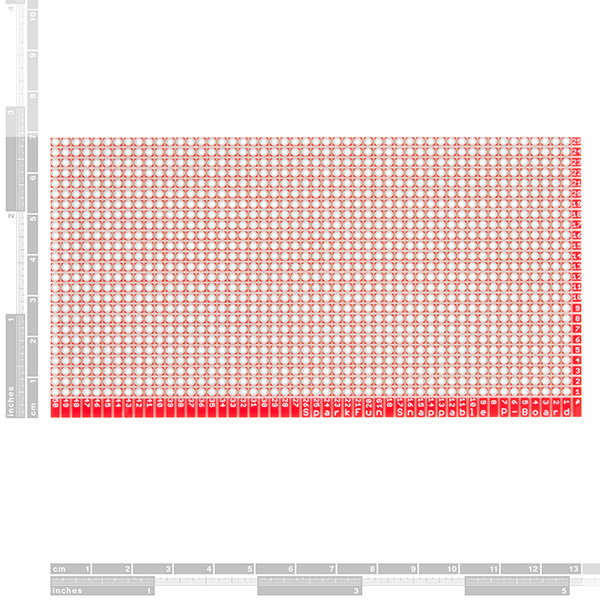 Sometimes I'd want 3 rows and would snap off 4; other times I'd want 4 and would snap off 3. I tried the method on the Sparkfun video without success. I ended up using a thick plastic breadboard, which had a solid, sharp edge on it as a guide, and pressed the corner down firmly onto a table while bending up the protoboard. Even then, I had to adjust placement of the edge to get the break where I wanted it. The board requires a fair amount of force (torque?) to snap apart as-is, so my suggestion for improvement is to score the lines between rows a bit deeper. That would make it easier to snap apart accurately. And I don't think the resulting boards would be too flimsy (unless the scoring went really deep). I needed a protoboard that was long and thin to fit inside a model airplane, and this was the perfect choice. The grooves do cause the board to bend more easily, but the board is still very sturdy. I used an Xacto knife to score the groove I wanted to break along, then I clamped the board to the edge of my table so that the groove I wanted to break along was over the tableâs edge. I had to apply considerable pressure before the board would break, and it broke on the proper groove first try. I definitely recommend this product to anyone who needs a custom sized protoboard.